Denon TU-1800DAB review | What Hi-Fi? Denon has a superb track record with analogue tuners, and it's proved itself perfectly capable of continuing that success in the digital radio arena. The TU-1800DAB is a hybrid model, capable of handling FM, AM and, of course, DAB broadcasts. You're provided with all the necessary aerials – and the DAB antenna even has a magnetic base to help secure it in place. An elegant and streamlined design makes the Denon an attractive piece of kit. The fascia features a large, two-line dot matrix display that's easy to read and can be dimmed at the touch of a button. 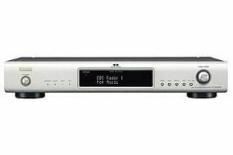 Around the back, in addition to standard phono outputs, you find optical and coaxial outputs that'll allow you to connect this Denon tuner to a home cinema receiver. Saving your favourite stations isn't a problem, since the Denon caters for a mammoth 200 presets (100 DAB and 100 FM/AM), and DAB tuning is simple – hit the Autotune button and the unit will scour the airwaves for all available channels. You can then cycle through and select stations via the unit's basic remote control or the responsive fascia scroll wheel. Music is delivered with great fluidity and smoothness. Vocals are full-bodied, refined and sound expressive and natural. Whether it's Elton John's Rocket Man on Capital Gold or Roger Sanchez's summer classic Another Chance on Kiss, the Denon delivers an entertaining musical performance, full of rhythm and drive. The tuner uncovers a good level of detail thanks to its clear and relatively uncompressed delivery. Denon has long had a reputation for top-notch tuner separates at sensible prices. The TU-1800DAB is a great buy, and does that reputation no harm at all.